An excellent book to read to understand why humanity has disease. By reading Henry Wright, Pleasant Valley Church, A More Excellent Way PDF download, you will understand your thought life and different types of diseases and their causes. Also, read many miraculous healing stories of testimonies of god doing the impossible. Hard copy usually goes for $24.00 but you can get your copy in PDF format for only $9.75. The problem is spiritual, psychological and biological disease and what can we do about it and where is God in it today. This book is designed to be an insight into a problem and its solution: disease prevention and eradication. A must read book on miracle testimonies of god within the book. Such as testimonies of god healing incurable diseases. The book, A More Excellent Way download, is on the cutting edge of a problem and its solution and give you increased knowledge and understanding to your situation and your disease problem by understanding the different types of diseases and their causes. Touch of God International Ministries is wanting to stop disease and to better equip the saints and the Church to defeating spiritual, psychological and biological diseases. I was healed of 10 different diseases and live now a normal life not plagued with allergies, pain, mental torment, etc. This book takes the mystery of disease to be able to show from God’s perspective why humanity has disease or incurable diseases. Henry Wright seeker the Lord for answers and the Lord showed him the causes of disease or spiritual root of disease. This book, A More Excellent Way PDF format, shows you how god heals all sickness and disease especially if you’ve spent many dollars and gone through many healing lines not finding your solution for healing. Learn how God heals by dealing with spiritual roots of disease. This book shows biblical principles and teaching on divine healing through God when we understand the spiritual roots of disease. This books also helps you increase your discernment to help others in the body of Christ who have a spirit of infirmity. Why don’t you buy this book and get on the road of healing. We do have conferences that teach on the material to help those sick with disease find answers and find healing especially on the day of miracles at the end of the service when we lay hands on the sick. 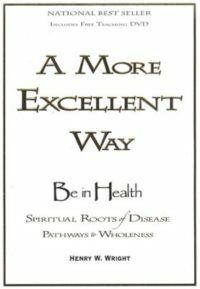 Purchase Henry Wright A More Excellent Way eBook and Learn about Spiritual Roots of Disease specifically. You can own your own copy of this book. Order today.